Katie turns 4 on October 23! to come to the BAYOU to help them celebrate! The calm before the storm! It seems that it always begins this way. Here I sat in the main concourse waiting area, sitting by myself, watching the skies through the wall of glass in front of me. Katie stood across the room, nose pressed to the glass, as she waited for the arrival of her friends. Growing impatient, she paced back and forth along the window, dragging her paw along the glass as she paced. Riley sat near her, but was much more relaxed. He was slouched down in a leather chair, his feet stretched out in front of him, front paws clasped behind his head, completely relaxed. He smiled as he watched Katie's impatient pacing. Stirring the pot a little, he commented,"Hey, sister girl. You're gonna have to CLEAN that window, ya keep putting your dirty ole paws on their clean glass!" Katie whirled around and threw her brother a blistering look. She opened her mouth to return the compliment, but was distracted by the noises overhead. Katie and Riley both raced to the window, eagerly searching the sky. The noise was distinct and immediately recognizable. It was 'Sleek ONE' ! No other plane had the deep roar that was the voice of 'Sleek ONE'! But, this was somehow different! Unable to control my curiosity, I joined Katie and Riley at the window. Laying a hand on each wee furry head, I waited for the first glimpse of the sleek, silver jet. The roar increased until the very walls began to vibrate around us!! Katie looked questioningly at Riley, but he only smiled broadly, then shrugged. "Wait and see!" was all he said. Katie and I both stared intently at the sky, then leaped back as 'Sleek ONE' streaked across the sky, not 100 feet above the airport flight line! But, that wasn't what had me speechless!! Flying NEXT to 'Sleek ONE', in a tight fighter-formation was the ORIGINAL Scotcorde!! BOTH Scotcorde supersonic jets raced across the sky, wings within inches of each other, their engines spitting flames. Suddenly, 'Sleek ONE' peeled off to the left, then climbed for the heavens, nose completely vertical as the plane clawed its way through the atmosphere. Jerking around, I searched for the ORIGINAL Scotcorde, and saw it race off to the right in an identical maneuver...it too racing toward the heavens!! Katie squealed with glee....clapping her paws together, and patting Riley vigorously on the back!! "SUPER, Riley !" she gleefully squealed. "Absolutely SUPER!" Riley smiled, and explained. "Well, we had to bring the ORIGINAL Scotcorde out of the hangar. Between the 121 BASH guests, and the 50 airboats, 35 swamp buggies, TONS of equipment and supplies.....we HAD to use them both!!" Katie laughed as she watched both Scotcordes bank sharply, then began a dangerously steep descent toward the runway. They were both planning to land TOGETHER!!! I gasped as I watched the two sleek jets drop toward the ground. There wasn't ROOM for both on the runway!! I held my breath as the landing gear was lowered on each jet, then could only gaze in amazement as the two huge jets settled softly to the runway, wings STILL only inches apart. The two planes raced down the runway, each a mirror image of the other. At the far end of the runway, both planes finally slowed to a stop, then taxied over to a quiet corner of the airport runway. I smiled to myself. Captain 'Scotty' surely knew how to keep his 'wee ones' out of trouble!! He parked as far away from the concourse as possible, to prevent any possibility of his youngsters causing problems. Riley grabbed my hand, and tugged. Katie had already began racing down the concourse, headed for the baggage cart parked outside. We soon were speeding across the tarmac, racing towards the spotlights and the flurry of activity around both Scotcordes. It wasn't until we pulled up to 'Sleek ONE' that I began to wonder....... "okay, so WHO flew 'OLD Sleek' ???" Ohhhhhhhh, SURELY it's not that ridiculous BARNEY FIFE pilot, again!!!" I began hurrying forward, determined to get RID of this menace to the terriers, once and for all!! Nearing 'Sleek ONE', I saw Captain 'Scotty' sauntering down the steps, his smile lighting up his entire face. His blue eyes twinkled, his dimple deepened, as he smiled broadly and began walking toward us. Just as I was about to ask about the pilot of 'OLD Sleek', a commotion drew my attention. I turned to see the pilot emerge from 'OLD Sleek' and saunter down the steps toward us. Something was eerily familiar about that 'saunter'. Then, I looked again. It was Captain 'Scotty'!!!!!! No, he stood next to me, smiling devilishly. The pilot walked up to me, put his hand out, and introduced himself. "Hi, Ms. Carol," he said, with that same devilish smile. "I'm Scott Terry's twin brother, David. But everyone calls me DIGGER!" I glanced from one twin to the other...... they were identical!! Happily, we began chatting. Captain 'Scotty' had told so many tales of BASH adventures, and terrier bravery, that Digger finally had determined to see things for himself. Digger smiled as he watched the terriers race down the steps, hurrying over to help unload 'OLD Sleek'. Katie hurried over to help Casey Grieco round up Sophie's pups. The 5 month old pups were having a field day, dragging the seat cushions down the steps onto the runway where they were shredded in short order. Ringo, Herbie, Jazzy, and Janice were joined by Lucky Laddie, another enthusiastic 5 month old. The entire group was being led by Lenni Goetz and 10 month old Bailey Doud, who took great glee in showing the smaller pups the correct way to kill a seatcushion woobie. The wee warriors were soon headed BACK up the steps, after more seat cushion victims! Katie laughed at the youngsters, and told Casey to relax. The wee ones would be looked after. She smiled as she saw the huge white form of Forrest,a Great Pyrenees and the newest member of the Guardian Brigade, race up the steps after the wee ones. Hearing the yipping noises coming from the plane, she knew the discussion was NOT going as the pups wanted! Casey and Katie smiled as Forrest herded the entire group of beligerent pups back down the steps, his huge white paws gently gathering the escaping group of wild-eyed youngsters back to his side. Every few steps, at least one of the pups would sprint away from the group, followed quickly by the others. Forrest's great size guaranteed that the wee youngsters would very quickly be rounded up, again!!! Katie watched in amazement, as Forrest gently continued to herd his wee wild ones to a safe area, where they could play in relative safety. Activity around both planes was hectic, and everyone was excitedly unloading equipment, when they heard the noise in the distance. All activity stopped.....and all heads turned toward the sound. Through the approaching darkness, the terriers saw the lights flashing, heard the horns blaring, the engines racing, and saw the headlights closing rapidly!!! Suddenly, a beat up and bent Harley raced out of the darkness, and wheeled to a stop by Riley. Emmitt Bad Boy, windblown, haggard, and out of breath, could only say, "They're right behind us!!!! We gotta MOVE, NOWWWWWW!" Almost at the same instant, from the darkness, came a HUGE 18-wheeler, lights blazing, as it raced across the tarmac. At the last second, the great rig turned suddenly, barely avoiding 'Sleek ONE'. The rig careened dangerously to one side, and the terriers held their breath.....watching as the trailer rocked back and forth, threatening to overturn and crash into their beloved jet. Amazingly, the rig pulled to a stop within mere feet of Captain 'Scotty' and Digger. Murray Reyner stuck his head out of the driver's window of the rig and calmly announced,"We've brought the entertainment.....AND the security forces!" He laughed as he pointed behind him, to the dozens of police cars, lights and sirens blaring, all closing in on the group of terriers. Digger looked at his brother and smiled. "I guess you WEREN'T making it all up, BROTHER dear!" Laughing, Captain 'Scotty' and Digger leaped into action. "Ms. Carol," Digger shouted. "You have to STALL 'em!" "Let's GO, youngsters!!!! We've gotta MOVE, NOW!!!!!!!!!!!" Then, the bedlam broke out!!!!! How was I supposed to do THAT??? I glanced quickly back to the frenzied work going on around the truck. Everything that would possibly fit, was being shoved and pushed into the back of the 18-wheeler's trailer. What wouldn't fit, was being stacked onto the swamp buggies. Bonnie Bell Mitchell, Ben Riley Barfield, Maggie Mac, and Zack Burks were frantically loading the airboats onto small trailers and hooking them onto the rear of the swamp buggies. Angie Riches was grabbing boxes and tossing them into the nearest swamp buggy. The Guardian Brigade was busy rounding up all their youngest pups and was hard pressed to keep them IN the buggies where they'd been placed. In seconds, the area was cleared. Captain 'Scotty' and Digger raced back to the Scotcordes, boarded the jets, and began bringing the huge engines to life. Breaking out of my amazed stupor, I whirled around, and saw that the police cars were rapidly approaching. An idea began to grow. Smiling, I ran my fingers through my hair, tossling it. Giving myself a bedraggled look, I began staggering toward the approaching sirens, waving my arms above my head wildly!! "HELP!! Help me, PLEASE!!!" I wailed. Taking a great risk, I threw myself onto the ground directly in front of the lead police car, and began beating the ground with my fists. "OHHHHHHH, the shock!! What was I to do?? I couldn't...... they were toooooo awful!!!" The police cars screeched to a halt, surrounding my location. As I peeped out of the corner of my eye, it reminded me of the wagons being circled before the attack. I heard the officers approach, and continued my Academy Award winning performance. "They were hideous!! So furry..... awful!! No one would believe it!!" "Ma'am??" the officer asked. "Ma'am, can we help you? What's the problem?" "I was abducted by furry creatures. They have been on an alien planet where the inhabitants are huge furry beasts with great, lethal teeth. They fought a battle with the Gorkons and they had a party on a fuzzy planet, and............ and .......... OHHHHHHHHH, it was too horrible!!!!!" At that point, I felt a little hysterical sobbing would be in order, so I turned on the water-works!! It worked!!! The officers looked at each other, totally confused. Finally thinking that I'd had some sort of breakdown, they gently lifted me to my feet, brushed the mud and grass off my face, and began escorting me to one of the waiting squad cars. Falling, exhausted into the rear seat of the squad car, I heard the officer talking into his radio. "She's delusional, sir..... taking her to the mental unit for observation. Yes sir, she's restrained. Yes sir, we'll watch her." Smiling, I knew I'd accomplished my mission. Lifting my head just far enough to see into the distance across the airport, I was the only one who noticed the jets disappearing on the horizon, or the 18-wheeler and it's convoy of swamp buggies and trailers, racing toward the swamps!!! It had been that last sudden turn that had thrown her off-balance. Katie grabbed desperately for something to hold on to.....Webber reached over and with one paw, pulled her back into the speeding swamp buggy. She breathed a sigh of relief, wrapped a paw around the handle on the dashboard, and stared straight ahead. She could hear Haley Devine and Angie Riches behind her, squealing above the wind and the roar of the engines. Glancing back over her shoulder, she was shocked to see BOTH girls smiling broadly, their front paws held high over their heads! She smiled as she glanced down. Both girls had their back paws locked under the bars of the front seats. She looked around her at the dozens of swamp buggies, filled with terriers and their friends, lurching along the dusty, rutted road. Paws were grasping for any pawhold they could find, whiskers and eyebrows were plastered to their head. Buggies tore down the seldom-used road at full speed, the passengers barely able to hang on. Looking closer, she saw every face wearing a wide smile, loving every minute of their 'life on the edge' ! She looked around and saw Bartholomew driving his buggy like his life depended on it. Both paws on the wheel, he stared intently at the road ahead. 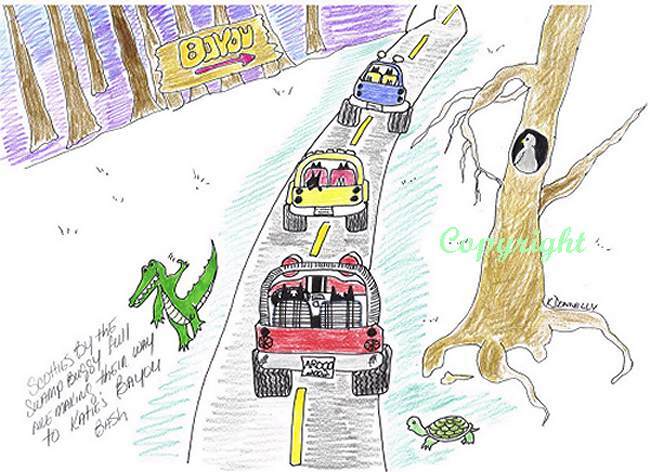 Katie saw Ginger Flewharty, Duffy Tracey, Sherman Mathison, Baillie Cantrell, Angus Sauls, and Midget Wion all wedged tightly into Bartholomew's swamp buggy, and hanging on for dear life. 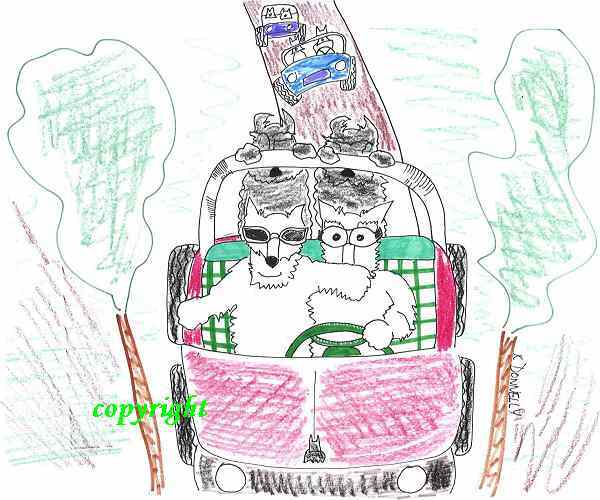 Katie was relieved to see Bartholomew taking his driving so seriously, with the lives of his passengers in his paws, and was startled only seconds later to see him swerve violently to the left, circle around a huge cypress tree, then veer back to the right and return to the road. She watched intently, and was rewarded seconds later, when he repeated the maneuver, this time to the right, to circle around a rotting log. Again, he returned to the rutted road, continued forward for a short distance, then again would race off to circle some obstacle before returning to the road. Each time, his passengers were thrown around the buggy. And, each time, they grabbed desperately for a pawhold. Katie noticed, however, that each time, the squeals and screams were not from fear but the thrill of the ride! She heard Sherman shouting to Bartholomew, "LEFT! Over there!!" 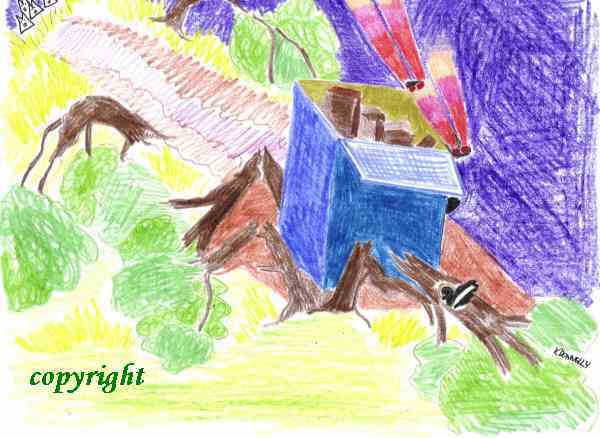 Then, Baillie pointed some landmark on the OTHER side of the road, and the buggy swerved back in the opposite direction. Katie laughed as she saw the buggy full of terriers, thoroughly enjoying their adventure. She looked over her shoulder to find others also taking this opportunity to stretch their paws. Spencer Goetz's buggy was filled to overflowing, also. Cammster Meverden had Sofy Bradberry in his lap, a paw wrapped firmly around her waist. In the back seat, Angus Martin, Bonnie Gamble, Connor Bruce, and Barney Powers were clutching anything they thought would keep them inside the buggy, as it bounced dangerously over the deeply rutted road. Spencer sped up as he realized that Dunc McGillivray's buggy was attempting to pass him on the narrow, tree-lined road. Spencer looked over at Dunc's buggy, and saw Spoiled Stormy seated firmly next to Dunc, running one paw over Dunc's muzzle to keep his beard out of his eyes. Dunc had one eye on Spencer's buggy and the other eye on Spoiled Stormy. Spencer laughed when he realized that Stormy was the one watching the road ahead! Dunc's passengers were thoroughly enjoying the daredevil ride. Jade and Rosie Hoare were daring each other to turn loose of the pawhold each one had on the buggy. Campbell Donnelly took them up on the dare, bouncing around wildly in the back of the buggy. Dunc's paw pushed the accelerator further down, and the buggy leaped forward, followed closely by Spencer and his group of squealing passengers. Katie worriedly searched for the puppies' buggy. She finally recognized Ty's reassuring profile, as he drove the buggy filled with excited, aroooooo'ing puppies. She laughed as she saw Jubilee, Forrest, and Dom all trying desperately to keep the wee ones from leaning out of the buggy, as they tried to grab the twigs, limbs, leaves, and branches that flew by their always-open mouths. Sassy, Bran, and Zack Burks were having trouble with their buggy. The 2 tons of beef treats had thrown the balance of the buggy off. Each bump caused the buggy to wobble dangerously. As Sassy drove, Bran and Zack were desperately throwing themselves onto the enormous pile of treats, to prevent the entire load from being thrown out of the buggy onto the dusty road. Everywhere, there were buggies flying down the road, racing each other around fallen trees, cypress knees, scrubby bushes, and wet marshy areas. Emmitt Bad Boy raced along on his battered, mangled Harley, loving the wind in his whiskers. He smiled as he heard his passenger squeal again. Casey Grieco wrapped her paws more tightly around Emmitt's waist, then squealed into his ear, "Faster, Emmitt.....FASTER!!" "Yessum!!" he shouted, as the motorcycle leaped forward. Following along behind the swarm of speeding speed buggies was the overloaded 18-wheeler, Murray Reyner at the wheel, blowing the horn each time he hit a rut in the road. Behind him, in the cab, Molly and Maggie Reyner were using the CB to maintain contact with their friends in the buggies. Suddenly, over the CB, Maggie Reyner heard Riley's command... "stop HERE!" "Where????????" he asked, as the 18-wheeler continued to speed down the road....then realized that now, there WAS no road!!!!!!! He looked up and saw all the swamp buggies, stopped at the edge of a huge, dark swamp. The huge, heavy 18-wheeler, unable to stop, raced on by the buggies. "MURRAY!!!!" Molly Reyner screamed.....as the huge rig tore through the brush and mud, making its own road into the swamp. Chapter 4 The SEARCH ! The scotties watched in shock as the huge tractor trailer sped past them, making a hole in the thick foliage as it disappeared into the swamp. Riley, Connor, Bucky Sheets, Tucker Warner, and Simon Livingston were the first to react, as they raced into the hole left by the truck. Realizing that their friends needed help, the other terriers leaped out of their buggies, and followed the search leaders into the dark swamp. Trees had been knocked over, bushes and undergrowth had been mowed down like so much lawn grass. That truck had made a wide path of destruction on its race into the bayou. The terriers looked around at the carnage, and began worrying about their friends who'd been aboard the truck on its flight through the swamp. Ty, Jubilee, Dom,and Grace were hard pressed to keep the enormous group of terriers and their friends together, as the younger adventurers kept spreading out to explore dark patches of swamp that caught their attention. Forrest, the huge white Great Pyrenees, and Honey Bear, the enormous malamute, had the task of leading the group and clearing the path of anything that could be a danger to the fearless, wee adventurers. Forrest turned to Honey Bear, and asked again, "Okay, we're supposed to do WHAT when we come across an alligator???" Honey Bear chuckled, then replied, "Well, since I guarantee they've not seen canines as large as EITHER one of us, I figure we need only to bark a couple of times with our deep, husky voices!! That should 'shock the scales' off of 'em!! Then, if that doesn't work, we'll just let the terriers have 'em!!!! That'll DEFINATELY take care of the 'gators, once and for all!!!" Both huge dogs laughed merrily at the thought of the joy and jubilation their wee terriers would have, if allowed to take on the gators. They then proceeded on ahead, searching the dark, murky water for the dangerous gators and snakes that inhabited these swamps. Doanie, Jazzy, Jazzalyn, Angus Sauls, Bailey Doud, and Charmer Hoare were having a grand time!!! They noticed Forrest and Honey Bear, far ahead, searching the water for something, and decided that the great beasts needed their help. All raced forward eagerly, mud and water flying up under their splashing paws. They laughed as the mud and water covered Dougan, Bear Powers, Hamish MacBeth Wilson, Wolfgang Yeager, Mackenzie Quigley, and Billy Delli Carpini as they raced past. The youngsters continued on toward the front, eager to offer their help and assistance to Forrest and Honey Bear. The wee, mud-slinging youngsters didn't realize what they had started. Billy looked over at Hamish and doubled over in laughter. "You have moss and ooze ALL over your face!" he chortled. Laughing, Hamish picked up a pawful of smelly swamp mud, turned to Billy, and with a toss of his paw replied, "Ahhhh, funny thing!! You seem to be covered in swamp slime,too, Billy!!" A stinky mud fight began in earnest, then. Mud, ooze, moss, and unidentifiable swamp slime flew wildly. Mackenzie Quigley, Dougan, Wolfgang, and Bear immediately joined in, and soon all were unrecognizable. They then turned their attention to other passing victims...... errrrrr, terriers. Bonnie Belle Mitchell, Spoiled Stormy, Katie, Lucy Sheets, Chelsea Brown, Rosie Fiona Seeger, and Heather Tracey trotted past, saw the boys at their silly game, and rolled their eyes at the silliness of these fellows. That was all it took. Mackenzie Quigley grabbed a huge paw load of swampy ooze, and hurled it toward the snooty girls, hitting several as the swampy mess splattered over the group of wee lasses. Retaliation was immediate and deadly. Slime, ooze, and pawfuls of smelly mud flew fast and furious. Squeals, giggles, and snapping teefers echoed across the swamp as the fight progressed. MacBeth Ward, Quincy Knuckles, Millie Phillips, Abbie Gamble, and Meaghan Barfield continued their trek through the swamp in search of the missing truck, giving wide berth to the mudfight, being VERY careful NOT to make direct eye-contact with any of the mudfight participants as they passed. Up front, Forrest and Honey Bear had MORE help than they ever thought they'd need! The wee youngsters were racing around searching for the 'big scaly log monsters', eager to compare teefers!!! The huge Guardians were hard-pressed to maintain ANY control over the small, enthusiastic hunters! The occasional grunt from one of the huge Guardians was proof that the young hunters had teefers sufficient to strike fear into ANY unwary alligator! Seeing the wince on the faces of the Guardians, as one of their great paws got in the way of those innocent, baby teefers, was a sure sign that these little hunters were up for the challenge. Ty, Dom, Jubilee, KayCee, and Gracie continued on past Forrest and Honey Bear. They smiled as they watched the two huge Guardians, so gentle in the face of those small, lethal tooth-machines!! They knew the wee ones were safe.....it was the GUARDIANS they were concerned about!! It was Dom who first saw the lights ahead. "THERE it IS!!!" he shouted. Immediately, everyone's focus returned to their mission. They were rescuing their friends!! As they drew closer, they could see the outline of the huge truck through the darkness. It's taillights provided a dim glow, acting as a beacon for the terrier rescuers. Suddenly, they all stopped..... they could only stare in shock!!!! The truck looked as though it had been driven INTO the ground! The tractor of the 18-wheeler wasn't even VISIBLE ! The huge truck was sticking down INTO the ground, much like an arrow that had been shot downward!! The only thing visible to the terrier rescuers was the back 1/3 of the trailer, sticking up OUT of the mud!! And the silence.... all around them..... nothing but deadly SILENCE!!! Ty, Dom, and Jubilee were the first to reach the truck. It had been driven INTO the ground, only the trailer visible, its taillights lighting up the dark swamp. Ty looked at Dom and shook his head. He was almost afraid to begin the search for Murray and his sisters among this destruction. Dom and Jubilee hurriedly searched the trailer. Seeing no sign of the Reyner pups, they located a spot closest to where the cab should be, and began to dig feverishly. The terriers soon reached the truck, and the digging intensified, everyone trying desperately to free their friends from the muddy crash site. The silence was eerie. There was no conversation at all, the only sound was the slurp of the mud being scraped away as they tried to reach their buried friends. It was Prince Maxxie Meverden who first heard her. "HUSH!" he barked. "LISTEN! I hear my Princess Mandi's sweet voice!" Everyone stopped digging, their ears perked to catch the slightest sounds. ...."I TOLD you it wasn't that way! We have to follow the TIRE TRACKS!" ...."but I thought this would be a shortcut!!" ...."you've never BEEN here before!! How'd you know a shortcut?!?" ...."AND why in the world didn't you go AROUND that last bump??" ...."it wasn't MY fault that big mound was there!!" ...."yes, it WAS! You didn't LISTEN to me!!" ...."we all tried to tell you, but NOOO, you knew best!!" ...."how was I supposed to HEAR, with ALL of you jabbering at once!!?!?!?!?" ...."well, NOW look what you've done!!" ...."what I'VE done!!! You all were here, too!! YOU helped!!" Into the clearing the Reyners trotted, dirty and unrecognizable through the layers of mud and slime. Totally absorbed in their family 'discussion', they didn't notice their equally filthy friends, clustered together around the trailer. "MANDI!!!!" Maxxie shouted, then raced forward and gathered his princess in his paws. Relieved at seeing her safe, he began to brush the mud and filth from her face. Murray, Molly, and Maggie stopped arguing when they saw their friends rushing forward to greet them. They happily greeted their relieved friends. After much hugging and back-patting, Riley cleared his throat loudly, asking for quiet. "Okay, we're all dying to know! WHAT HAPPENED???" Molly looked at Murray, spread her paws wide, and said, "Okay, brother dear....... explain THIS!!" Murray shot her a withering glare, then turned to his friends. All eyes were on him as he began... "well, Maggie told me to stop, but she didn't tell me SOON enough, and the mud was awfully slippery, and we'd run out of road, and when we passed all of YOU there at the edge of the swamp, I had my paws on the brakes, but those airboats and bumble balls are sooooo heavy, and that truck wouldn't slow down...... then we hit the water, and the mud covered the windshield and we couldn't see, and I kept my paws on the brakes, but the truck just kept going, then I felt the truck going up this little mound, and when we hit the top of the mound, the truck bounced, and my paws came off the brake, and when I tried to hit the brake again, I missed and hit the accelerator, and the truck just kinda FLEW off that mound, and we could feel it climbing, then it just decided to go down, and it went STRAIGHT down, and we got stuck in the cab and had to climb out through the window, and then we had to DIG our way back to the surface, and Molly, Mandi, and Maggie were really mad, and I wanted to get back to all of you , so I told 'em there was a shortcut back to y'all, and then we got lost in the swamp, and Molly finally made us follow our pawprints back here to the truck, and then y'all found us and that's all that happened!!!!!" At his last words, he finally took a long breath, and glanced innocently around the group. All eyes were wide in amazement... they were staring, open-mouthed at a filthy, swamp-covered Murray. It was Maggie Nuckles and Hoagy Devine that broke the silence. They raced over to Murray and his angry sisters, and began clapping them on the back!! Hoagy added, "You lucky DOG!! You got to wreck a BIG truck! Was it FUN?? Huh???" Immediately the other terriers began adding their congratulations to the Reyner pups, and the swamp was filled with much cheering and arooooooo'ing!! Murray smiled broadly, leaned over to his sister, Molly, and whispered, "SEE, we're HEROES!!!" Molly could only roll her eyes at Murray, then looking at her happy, slime-covered brother out of the corner of her eye, she broke out in giggles!!!! Brothers!!!! A sudden scream, broke through the celebration. They all turned back toward the sound, and saw Midget Wion pointing toward the 18-wheeler's trailer. The terriers watched in horror. Their truckload full of airboats and bumble balls was slowly disappearing into the swampy ooze!!!!!!!
" SAVE THE BUMBLE BALLS!!!!!" screamed Wee Stewart Almandinger. Without a second thought, Stewart, along with Robbie McGillivray, Charmer Hoare, Frasier Seeger, Cassie Joiner, Bear Powers, Rosie Goetz, Puck Grieco, and Bobbi King raced to the sinking truck, climbed up on the back, and disappeared into the depths of the trailer. Almost immediately, Bumble Balls by the dozens began flying OUT of the trailer. Terriers leaped into action, formed a 'Bumble Ball relay', and began passing Bumble Balls paw over paw, to be stacked up on a patch of dry ground next to an old cypress tree. Fergie Grant took Ziggy Riches by the paw and motioning for Charlie Mathison to join them, they hurried over to the growing pile of toys. They began organizing the pile into some sort of order, trying to make the best use of the very small patch of dry ground. Chak de Mitey Stacy watched the toys fly out of the rear of the truck, then noticed that the trailer had been dragged even deeper into the muddy swamp. "HURRY! It's sinking deeper!!" Chak shouted. Then, he raced over to the nearest trailer wheel, sank his teeth into the evil-tasting rubber, and began to tug! Seeing what Chak had in mind, everyone raced to help. 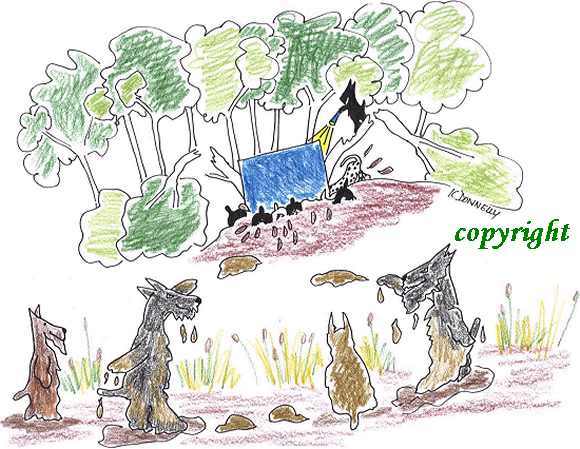 McKenzie Sue and Meaghan Barfield, Dougan and Zoe,Emmitt, KayCee and Sophie Donnelly clamped onto a tire, set their paws firmly into the ooze, and began back-peddling, determined to pull the trailer out of the mud by themselves! Forrest, Honey Bear, Ty, Dom, Gracie, and Jubilee stared in horror at the scene before them! The 18-wheeler was sinking ever deeper into the mud, with a trailer full of terriers INSIDE, desperately trying to save the trailer's contents. The outside of the trailer was covered in scotties, terriers, and their friends. Each wee terrier had some portion of the truck clamped firmly in their teeth. Front paws were dug in, furry fannies were sticking up into the air, and intense growling was coming from each clamped mouth, as the wee terriers WILLED the truck to resist the pull of the mud. Ty signaled his Guardian Brigade. Their wee ones were in immediate peril, and he knew better than to try to talk them OUT of this plan of action. The only way to protect their wee ones was to HELP them. The Guardians raced to the trailer, and as one, they clamped their huge jaws onto the rear axle of the trailer, sank their immense paws into the soft mud, and threw their weight against the pull of the trailer. Great Grandma Inky, seeing the combined effort to save the trailer's contents, began encouraging the terriers. "Put your BACKS into it!!" she screamed. "Darby Yeager, get in there and help them clear that trailer!" Darby raced into the trailer, followed closely by Barney Powers, Pagan, Bartholomew, and Heidi Delli Carpini. The Bumble Balls flew out of the trailer at an incredible rate. Fergie, Ziggy, and Charlie were hard-pressed to keep the enormous pile organized, and resorted to stacking them on fallen logs that surrounded the area. Suddenly, the raining Bumble Balls stopped. The terriers, afraid to release their hold on the sinking truck, looked up at the trailer out of the corners of their eyes. The sounds from inside the trailer changed, then Great Grandma Inky, shouted, "IT'S SINKING!!!! GET OUT!!!!!!" The terriers, unable to hold onto the sinking trailer any longer, were forced to release their holds. They fell back into the slimy mud, exhausted and dirty, and terrified that their friends were going to be trapped in the disappearing trailer. Suddenly, from inside the trailer, a hum was heard, growing louder. The terriers stared at the rear of the trailer, as it sank deeper and deeper into the ooze. Just as the rear axle of the trailer disappeared into the mud, the sky around the trailer suddenly was filled with airboats! Stewart, Puck, Robbie, Charmer, Cassie, Bear, Rosie, Frasier, and Bobbi each sat at the controls of an airboat filled with terriers from the trailer. 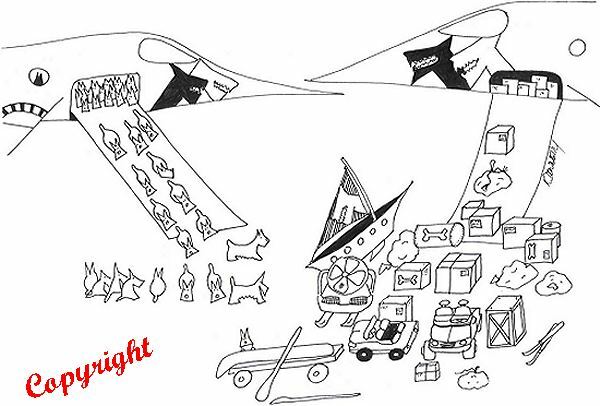 The boats were pointed toward the sky, the fans at full power, forcing the boats into an unnatural angle, as they lifted out of the trailer on cushions of air. As the truck disappeared into the swamp, swallowed up by the dark mud, the trailer heroes gently settled their airboats to the ground, and were immediately surrounded by their cheering friends. Ty and Jubilee sat back against a cypress tree, looked at the happy group of terriers, then looked at his filthy, exhausted Guardian Brigade. "Well, THAT was fun!!" Ty said, then ducked as Dom, Forrest, and Honey Bear each lobbed a huge paw full of mud his way!!!! Megan Bruce and Ace McStubbs Graves sat on the one dry piece of ground in the swamp. Megan had her paws pulled up under her to keep them from getting any MORE filthy than they already were! She and Ace were explaining BASH behavior to Salty, Hamish MacBeth, Wolfgang and Darby, Chelsea, and Gavin. The BASH newcomers were staring in amazement at the insanity going on around them!! Megan laughed, then explained to the first-time BASHers,"Well, ya have to understand. These Bashes are an endless party, but we learned a LONG time ago, that where terriers go......trouble's not far behind!! So, we use my brothers, Ty and Dom, along with the other volunteer members of the Guardian Brigade, to 'watch our backs'! And sometimes, they really have their paws full, trying to keep our furry muzzles out of harms' way!" Ace added,"But, never fear, we haven't lost a terrier YET! Just go enjoy yourself......let your paws down and party hardy!!" Megan and Ace's audience looked back at the group romping in the mud, dangerously close to the sinkhole left by the truck. They watched in awe as the terriers pushed, shoved, rolled, and threw the mud all over themselves and whoever they could reach with a good paw load of swamp slime! Mac Tracey, Tas Flewharty, Guthrie Cantrell, Douglas, Amber, Megan, and Freddy Hoare raced up, the mud in their paws oozing between their toes, and running down their legs. "Hey, guys!!!! Y'all gonna play Mud Marines with US????? ORRRRRRRR, ya gonna take the ALTERNATIVE?????" Tas asked, with a wicked gleam in his eye. He waggled his eyebrows devilishly, cocking his paw back, ready to lob what mud was left in his paw. Chelsea, Gavin, and Hamish MacBeth leaped up, and dodging the grinning Tas, managed to bump into Guthrie Cantrell and Mac Tracey. Guthrie and Mac immediately grabbed hold of Megan Bruce, to regain their balance.....but only managed to drag her into the mud WITH them. The three lay sprawled in the mud, staring up at the trees overhead, and noticed Dougan Jirik sitting on a limb, swinging his legs happily as he watched the mud wrestling going on below him. This was too much temptation for Dougan, who pushed off from the limb, and performed a perfect swan dive toward the slimy mud. Just before reaching the ground, he pulled his paws close to his body, turning himself into a furry cannonball, landing within inches of Megan, Guthrie and Mac. The resulting splash covered everyone in sight. The battle was on!! WrestleMania, terrier style began in earnest! Emmitt trotted around, grabbing any paw he could reach, and with a quick jerk, had each victim face-down in the muddy ooze. Scarlett Ohara Barfield, Bonnie Belle Mitchell, and Heather Sue Devine found themselves climbing up out of the mud, spitting the slimy mess out of their mouths, thanks to one of Emmitt's 'tugs'! Pagan, Flora Cantrell, and Miss Bailey Mulcahey tried desperately to cling to a low-hanging limb, their paws wrapped tightly around the limb. But, they were unable to prevent Emmitt from tugging them into the great smelly ooze, and soon found themselves wiping the mud from their eyes and mouths. Emmitt recruited Casey Grieco, and together they began sneaking toward the elders, who were sitting high and dry on an overturned log. Great Grandma Inky, seeing the two terriers stalking the elders, stared at Emmitt and Casey through narrowed eyes, and gave them a fierce glare. "You touch ME, youngsters, and I'll make ya EAT it!!!!!" she said, her lip curled to reveal a very large tooth! Great Grandma Inky continued to glare menacingly at Emmitt, who was respectful of his elders enough to realize when they meant what they said!! But, as he glanced behind her , he smiled to himself as he watched Sophie's youngsters, Ringo, Doanie, and Herbie sneaking up behind the overturned log. It only took a second for the bullfrogs in the wee scotties' paws to create havoc among the elders, who were trying desperately to distance themselves from the mud-hopping creatures. Laughing merrily, Ringo and Herbie leaped back out of the way, narrowly avoiding G.G. Inky's paw as it swung around. Doanie wasn't so lucky, and he found himself shoved backwards into the ooze, spitting mud out of his mouth. Forrest looked around the clearing, at the bedlam taking place in the mud. He looked at Ty, an amazed expression on his face. "These little ones act this way OFTEN??? This could be dangerous!!" Dom and Jubilee laughed. Gracie chuckled, then replied,"ohhhhhh, you haven't SEEN dangerous yet!! They're just blowing off steam, after worrying about their friends. If you're wise, you'll stay OUT of the way, and let them PLAY that energy off!! Otherwise, WE will have to get them out of even MORE trouble! This mud is doing just FINE, as far as I'm concerned!" Forrest shook his huge head, utterly fascinated with the terriers and the intensity of their play. Relaxing, he leaned back against the nearest cypress tree, prepared to enjoy the entertainment. Suddenly, a ARRRRRRRROOOOOOOOOOO echoed loudly above the laughing and giggling of the muddy wrestlers. 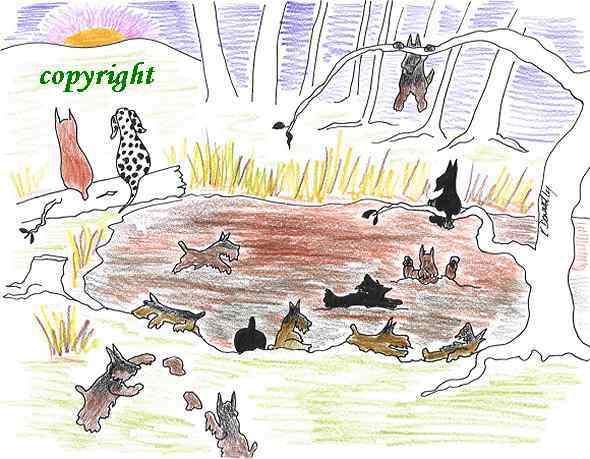 Everyone stopped in mid-fight, all ears perked up, they turned toward the sound, mud dripping from their furry muzzles. They immediately saw Riley, standing atop a cypress stump. Seeing that he had everyone's attention, Riley lifted his muzzle skyward and issued another deep, rich arrrrrroooooooooooo!!! He then announced,"Okay BASH guests, are you ready to party???? Our BASH Birthday hostess has arrived!!" The terriers crowded closer, curiosity visible on their muddy faces. Riley held out his paw, reached behind the nearby cypress tree, and gently pulled a mysterious figure into the dimly lit clearing. "BASH puppers, I present to you our party hostess.......Francie La ROUX!!!" Everyone gasped......for the figure was shrouded in darkness, a hood over her head prevented anyone from viewing her face. The hand that held Riley's paw was thin, gnarled, and wrinkled. The group was enthralled..... how exciting!!! A mysterious party hostess!!!! Hannah Livingston stepped closer to where Lucy Sheets, Sassy Burks, and Katie Wild Child were standing. She leaned over to the Louisiana scotties and whispered eagerly, "Who's Francie La Roux????" Like the television advertisement, all ears perked up, eager for the answer. Katie, Sassy, and Lucy exchanged knowing looks, then Lucy leaned very close to Hannah and whispered loudly, " Why, Francie La Roux is widely known here in the Bayous. Francie La Roux, better known in the Bayous as the 'Swamp Witch', had the attention of every terrier in the swamp. She knew of the adventurous spirit of these wee furry terriers, and admired their courage. Madame La Roux took Riley's paw and stepped out into the ray of sunlight that made its way through the thick canopy of leaves overhead. As she did, she heard an audible gasp from the ever-alert terriers. Straightening her shoulders, she raised her gnarled hand, and brushed the hood of her black cape back away from her face. It was as if time stood still. Not a sound was heard, nature had gone silent, nothing moved. The terriers sensed the change, their attention was on the mysterious figure standing in the one bright ray of light in that dark, gloomy swamp. They stared in awe as the Swamp Witch's hood slid back onto her shoulders. Madame La Roux, the Swamp Witch, released Riley's paw and stepped forward. The sunbeam, behind her now, cast her face in deep shadow. She took a ragged breath, and spread her wrinkled hands wide. The terriers held their breaths and stepped closer, eager to hear the Swamp Witch's words. Nothing moved, no one spoke, it was as though nature awaited the words of Madame La Roux. When, at last, she began to speak, her words were softly spoken....but with a strength that the terriers knew went clear to her core. "Welcome, wee ones," she almost whispered. The terriers took a step closer, then another. They were entranced with the mysterious lady's words. "Welcome to my home," she continued, spreading her arms wide to accept the entire swamp as her home. "You have come here this day to celebrate the continuation of life. You have brought your friends together to share in your celebration." She turned back to the sunbeam, lifted a hand, and watched as the sunbeam began to shimmer, then glow with a radiant light. The terriers stood spellbound as they watched the Swamp Witch control the glowing sunbeam. She turned back to the terriers, then said softly,"Fergy, Midget, Ali, Angie, Webber, come to me and share the celebration." A sense of wonder filled the swampy glade, as the confused terriers hurried to stand at Madame La Roux's side. When they were assembled as closely as they dared, she turned and raised her hand. The sunbeam turned a brilliant blue, then the sky appeared to open. The terriers stared upward, and held their breaths. From above the sunbeam, the terriers could barely make out the edge of the Rainbow Bridge!!!!! And standing on the very top, looking down, were all of their dear, beloved friends who had made that crossing. Midget looked up, and saw Brimley. Tears came to her eyes, as she raised her paw and waved excitedly. Fergy stepped over and placed her paw around Midget's shoulders. Together, they stood watching as Judge Brimley waved and smiled down at them. Suddenly, Angie's breath caught in her throat. It was Linus!! Ali and Webber hurried over to Angie, took her paw in theirs, and together they watched Linus as he smiled softly down at them, then stepped over next to Brimley. Madame La Roux spoke softly to the terriers,"Your celebration has been noticed across the Bridge. Your dear friends, above, wanted you to know that they celebrate along with you. They are still here with you, to help you, to watch over you, to offer you strength in that quiet moment. Your love for them has transcended the Bridge, and they come to you today to share in your joy. Share their joy as they celebrate in that glorious meadow across the Bridge. Your love for each other will only grow stronger, will only strengthen that bond between you. And, when you need to know that your dear friend is near, you have only to sit quietly, close your eyes, and listen with your heart. They will be there, just listen with your heart." 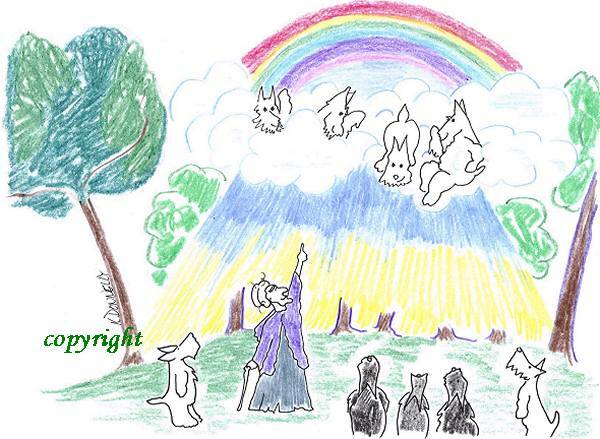 The terriers looked up into the glittering, blue sunbeam.......and watched as Brimley and Linus, along with so many of their beloved friends, waved happily to them, before turning and trotting back across the Bridge, to disappear into the mist. The Swamp Witch lowered her arms, and the sunbeam ceased it's glittering blue glow, returning once again to the yellow patch of sunlight. 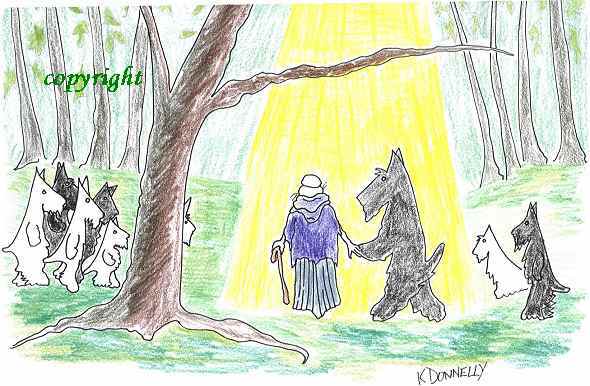 She glanced around at the tears on the faces of the wee terriers, and smiled softly. "Celebrate with them, celebrate FOR them, and celebrate the friendship you've shared with them. Each time you think of them, smile with the shared memories of the good times you had. For, each shared memory brings them to your side once again. Cherish the visit." She paused as the terriers wiped the tears from their faces. She smiled as she saw the deep breaths, the straightening of shoulders, the happiness at having seen their friends one more time. Opening her arms wide, she spoke loudly, "IT IS TIME !!!!!" With a flourish of her arms, she spoke again, "We go, NOW!!!!!!" Chapter 9 It's a PARTY ! Heather Tracey, Abby Goetz, and Petunia Jirik were the first to feel their paws touch the ground in the sunny, grassy glade. They were convinced they'd been FLYING across the swamp! "Did you see the swamp zipping along below us?!?!?!?! Petunia gasped, excitement glowing in her eyes. "It was awesome!! I could feel the wind in my fur!" "Ohhhhhh, and did ya see Pogo Flewharty grab those pine cones off that tree as he soared past, and then started dropping 'em on those alligators down on the bank!!!!! They sure were mad! He's so funny!" Heather giggled. "Did ya ever think ya'd fly withOUT the Scotcorde!?!?!?! And that flock of ducks that we PASSED! That was great when Piper arooooooo'ed at one of 'em as she zoomed by! The look on that duck's face was TOO funny!" Portland Piper Almandinger grinned, then raised her muzzle and arooooooo'ed once again. Heather, Abby, and Petunia broke into peals of laughter. Pogo trotted up and began quacking along with Piper's arooooo'ing, which reduced the girls to fits of uncontrollable giggling. Pogo, seeing an audience for his antics, launched into his entire repertoire of animal noises, much to the delight of his adoring audience. As more terriers felt their paws back on solid ground, they excitedly began sharing tales of their airborne trip across the swamp. Angie Riches, Terra Belle Warner, Molly Martin, and Sophie Donnelly were gasping for breath. It had been a close call! They'd been gliding along with the others, when that huge shadow had overtaken them. Angie had looked up, to see a great eagle, heading straight for them. She'd barked a warning, and the girls had immediately closed ranks, and bared their teefers, trying to convince the great bird that they were not going to be easy prey. The huge eagle had banked sharply when he saw the bared teeth of the flying fur-beasts. He flew higher, then turned and dove sharply, gaining speed as he drew nearer. The girls had known they were going to be in for a fight, and had floated close enough to protect each other. Just as they were about to attack the eagle, a fierce growl was heard from just above them. Looking up, Angie saw Duffy Barfield, his ears perked, flying right above her, snarling his displeasure at the eagle as he protected her from the eagle's attack. Not far behind Duffy, was Alexander Bradberry, Robbie McGillivray, and Bucky Powers, also flying protective cover for the girls. Alexander, Bucky, and Duffy began swooping on the eagle. Discovering that he was not as interested in these furry birds as he'd thought, the eagle gave one last fierce shriek and gracefully soared higher into the clouds. Thinking back on their adventure, Angie had looked at Duffy Barfield with gratitude and affection. "You saved us, Duffy! How brave you were! And that eagle was enormous! He could have......."
Duffy took Angie's paw in his, and squeezed gently. "Not while I'm around," he said boldly. Angie thought Duffy's swagger was absolutely breath-taking, and smiled brightly as he led her to a grassy spot under a nearby tree. Looking back over her shoulder, she saw Alexander escorting Molly Martin to a sunny patch of grass, and gallantly offer her his paw as she sat down. Sophie Donnelly was absolutely swooning under the attentive gaze of Bucky Powers, who was beaming happily as Sophie praised his heroism again and again. Then there were Robbie and Terra-Belle, oblivious to the others. Terra-Belle kept looking at Robbie and sighing, as she kept calling him "her terrier hunk"! Hannah Livingston and Zoe couldn't agree on what had happened. Hannah kept repeating,"But we were standing there in the swamp one second, then we were all in the AIR!! That Swamp Witch DID something, I'm TELLING ya!!" Zoe wasn't sure WHAT had happened, but she wasn't ready to admit that terriers could FLY......at least, not without their beloved Scotcorde!! Ali Riches and Gracie walked over and added their opinions to the discussion. Zoe and Ali soon began an earnest discussion of flight dynamics and the physics of terrier aviation. The chatter and conversations grew loud and heated, as the terriers tried to explain what had happened. It was Riley who got the group's attention, with his now-familiar arooooooooooo!!! Immediately, everyone grew silent, curiosity clearly written on their faces. Standing at his side was Francie La Roux, but now something had changed. A smile bathed her face in a wondrous glow. Everyone around felt a sense of growing happiness as they watched the Swamp Witch raise her arms. "I understand the purpose of your journey, terriers, and I now offer a gift of my own." The Swamp Witch reached out with one arm, and said simply,"Katherine, known as the Wild Child..... come to me." Katie immediately trotted over to stand between the Swamp Witch and Riley. She slipped a paw into Riley's paw, as she watched Madame La Roux excitedly. "Katherine, we understand that you celebrate a 4th birthday today. We know you have all that you could wish for, and have the love and adoration of your Mam and brother. We know that you have had great adventures. So, our gift to you, this day...... is a trip back to a gentler time. Our gift to you today, is a day of childish joy and happiness." Everyone waited breathlessly at the Swamp Witch's decree. They watched in awe as she spread her hands wide, then said simply, " Birthday celebration, begin!!" A great cloud of smoke filled the sunny glade. Through the smoke they could hear the sound of music, rippling on the air. As the smoke cleared, the terriers stared in wide-eyed amazement!! Katie's birthday was to be spent on a vintage carousel!!!!! But not an ordinary carousel........ the terriers cheered wildly as they gazed at the creatures who would be the terriers' beasts of burden for the afternoon. The carousel was completely adorned with PUHDULS!!!!!! Riley leaned over to Katie, smiled and said, "Happy Birthday, Wild One. Enjoy your day!!!!!" He kissed her softly on the cheek, then walked over to share tall tales with Connor, Bucky, and Bartholomew. Katie turned to see Webber walking boldly toward her. He held his paw out and gallantly said,"Our carousel awaits, m'dear!" Katie and Webber scurried onto the carousel, followed closely by Emmitt and Casey, Dunc and Stormy, Sophie and Bucky Powers, and dozens of their closest and dearest friends. The afternoon was joyous!!! The sunny glade was filled with laughter and happiness as the terriers spent blissful hours circling endlessly on the magical carousel. 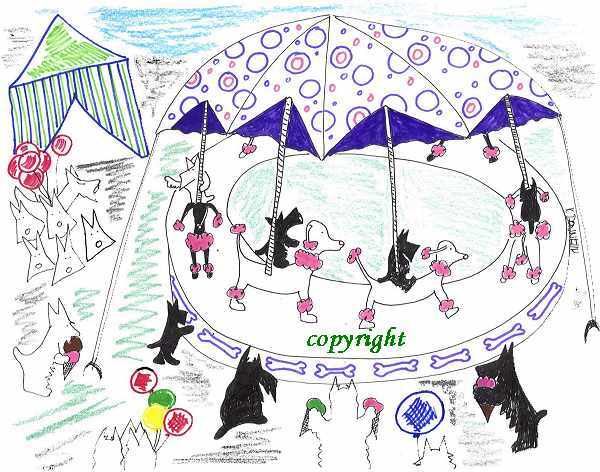 Even Sophie's youngsters found reasons to frolic as they raced around the carousel, pulling the tails of the PUHDULS, tugging on any stray whiskers, and taking turns leaping off the spinning carousel, to land in a heap on the grass. All to soon, though, Madame La Roux called for attention. She stood proudly in the center of the glade, as she called the terriers to stand near her. Regretfully, the terriers crowded around the Swamp Witch. She smiled at the small terriers around her and said softly," I am pleased that you have enjoyed your day in my sunny glade. Remember this time of blissful happiness, and make your own happiness each day. I now must return you to your beginning!" And with one great wave of her hand, the terriers again felt themselves leaving the ground...... to find themselves, seconds later, standing back at the edge of the swamp at the far end of the airport. "Awesome!! We're back where we STARTED!!!" Turning around, Puck Grieco and Cassie Joiner were the first to notice it. Sassy, Bran, and Zack Burks' swamp buggy, LOADED with beef treats, sat where they'd parked it. "FOOOOOOOD!!!" Puck and Cassie shouted, before racing for the treat-filled buggy. Realizing that they were famished, the entire group fell on the swamp buggy full of treats, lips smacking, noses twitching. It didn't take long for the terriers to finish off the snacks that Sassy's Papa had provided. Tummies full, they sat back in the grass, their paws behind their heads, enjoying the peace and quiet. Stormy and Bonnie Belle, clearing their throats loudly, broke the silence. "Okay, terriers!!!!!!! Now, it's OUR TREAT!!!!!" The two girls reached into their pockets and pulled out...the legendary platinum credit cards!!! Chapter 10 SHOP - A - THON ! Spoiled Stormy twirled her platinum card through her fingers, the light reflecting on the shimmering plastic. The terriers' eyes lit up at the thought of helping Stormy have 'fun' with her favorite toy! Hannah and Dusty Livingston raced up to Bonnie Belle Mitchell, and began whispering excitedly into Bonnie's ear. "What a brilliant idea!!!!" Bonnie exclaimed. Turning to her friends, she announced "We're all going to BEGIN our shopping marathon by cleaning ourselves UP!! We are ALL going to be pampered and groomed at the 'Million Bucks Grooming SPA' !!!!!" Several of the guys turned their noses up at the notion of getting a BATH!! But, after much persuasion from Stormy......and a LOT of help from Dunc, Katie, and Stormy's credit card, they finally agreed. It didn't take long for the 121 filthy, swamp-covered puppers to speed across town in their unrecognizable swamp buggies. The entire group burst through the front doors of the VERY exclusive and VERY posh 'Million Bucks Grooming SPA', drawing shocked gasps from the manager who'd been brushing an Afghan hound that sported a diamond-studded collar. "Just a minute, now!!" the manager said, looking down his nose at the filthy terriers. 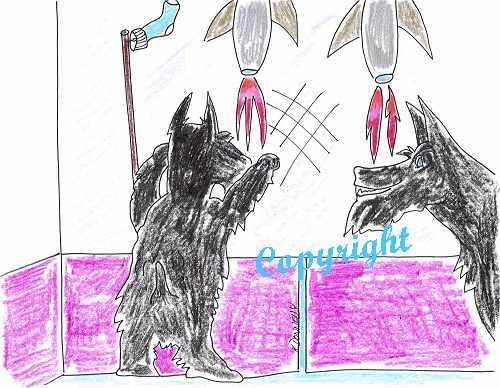 Bonnie and Stormy pranced up to the manager, gave him a definate Scottie LOOK, and slapped their platinum credit cards on the counter with a resounding pop! "You just HOPE we spend our money here at your establishment," Bonnie said through gritted teeth. She started to reach for her card, then looked back at the manager, a smug smile on her face. She waited for the inevitable response. The manager stopped immediately when he spotted the platinum proof of an extensive credit line! "Why, of COURSE you're welcome here," he crooned. "WhatEVER you want, anything at ALL!!" Bonnie turned and winked at her friends. Stormy wagged her paw, and the entire group followed the now VERY agreeable manager into the dressing rooms. A short time later, the terriers found themselves wrapped in thick, plush terrycloth robes. They followed the manager, who opened a door and told the girls that an attendant would help them with their first spa cleansing. He led the boys on down the hall, as the girls hurried into the luxurious room, lit with crystal chandeliers. The attendant invited the girls to leave their robes on the silk-upholstered chairs that sat around the room. She then led them through another door, to what looked like a huge swimming pool......only there was no water!!!! Katie realized what this first spa room was for, and almost doubled over laughing. The others quickly realized what was happening, and as they all entered the "Mystical MUD BATH", they laughed gleefully at the thought of PAYING huge, exorbitant prices for the SAME mud that they'd been covered in for the last 6 days!!!!!!! Stormy smiled broadly as she sank down into the warm, fragrant ooze. "Yes, but THIS mud smells NICE," she said, letting the very EXPENSIVE mud slide through her paws. The girls spent most of the morning, leaning back against the edge of the "Mystical MUD BATH", terry towels wrapped around their heads to keep their delicate ears clean. They could hear the guys in the next room, and with the occasional bump on the wall, they KNEW that more mud fights were taking place!! Finally, Stormy announced that it was time to move ON!!!!!!! 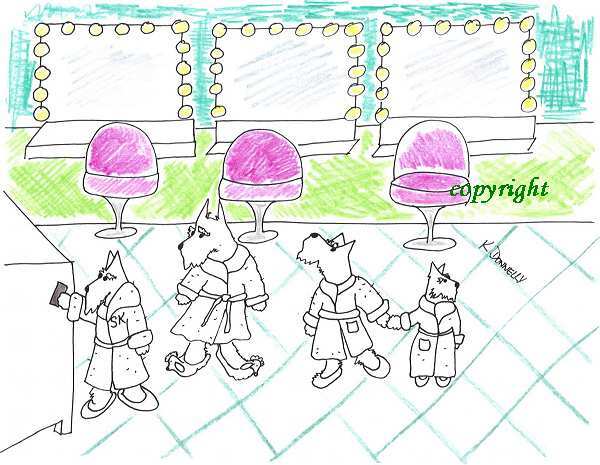 In short order, the terriers left the mud bath, proceeded to the rinsing rooms, then on to the "brush and foo-foo" room. That was where the terriers put their paws down. NOPE!! They were NOT going to be "foo-foo'ed"!!!! The manager reluctantly agreed to let the terriers 'air-dry'. Bonnie and Stormy quickly settled the bill, and led their friends back out to the street. "Okay, it's your birthday, what shall we do NEXT??" With a wicked gleam in her eye, she looked over at Murray Reyner, then looked back at the group gathered around her. "WELLLLLLLLLLLLLLL, since Murray had such a grand time, I'd like to learn to drive an 18-wheeler!!!!! Let's go to the Deisel Driving Academy for an afternoon's worth of driving lessons!!!" Wild cheering erupted as the terriers thought of the mahem and havoc they could create with big TRUCKS!!! The filthy swamp buggies were left parked outside the 'Million Bucks SPA'....they were now just TOOOOO dirty to be of any further use!! A quick phone call brought the immediate response of several stretch limos, very EAGER to be of service to the well-heeled terriers. The BASH bunch soon found themselves lined up in the parking lot of the Deisel Driving Academy, with an instructor giving very loud and monotonous directions. After a quick wave of the 'wondrous credit cards', the instructor brought out his entire fleet of deisel trucks, lined them up in the huge parking lot, and told the terriers to 'have at it' !!!!!!!!!!! Well, let me say right here........it was not PRETTY, but it was a lot of FUN!!!!!! I'll just suggest that each Mam and Dad may want to ask their furchild about their driving experiences. What I CAN tell you is that the terriers now OWN a fleet of 18 wheelers!!!! The afternoon sped by, LITERALLY!!! All too soon, the terriers realized that it was time to return to their homes and their families. The stretch limousines quickly delivered the BASH party-goers to the airport, where their beloved Scotcordes sat waiting. Katie and Riley stepped onto the bottom steps of "Sleek ONE". Katie raised her paw for silence. Everyone gathered close to hear the Wild Child's parting words. "I want to thank you all for coming to share this birthday event with me. It means so much to have my closest friends share in this joyous occasion. As a birthday gift to each of you, you'll find a year's supply of Bumble Balls onboard the Scotcordes, as well as the title to your own 18-wheeler, to be selected from a dealer near you!!" The terriers broke into wild applause, cheering Katie. She shook her head, and merely pointed. Bailey Doud stood proudly, waving his paw, accepting the gratitude of the terriers for his gracious gifts!!!! As the terriers boarded the Scotcordes for their trips home, they turned and waved one last time to Katie and Riley. Katie raised her paw and said, "See y'all in January at the next BASH!!! We oughta have Mam out of the Assylum by then!!!" Laughing, she and Riley watched their friends board the Scotcordes, saw the doors close, and watched as the huge engines roared to life. 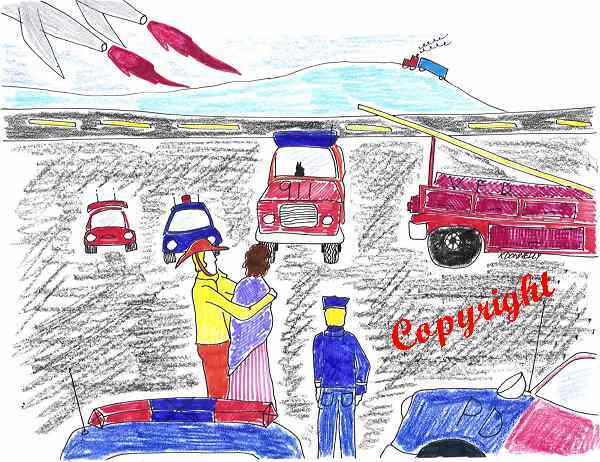 They watched in silence as the two jets sped down the runway, twin images of each other. Once in the air, the two jets rose sharply, then suddenly parted. One banked East and one banked West, each making deliveries of tired terriers to their waiting families. As the Scotcordes disappeared on the horizon, Riley turned to Katie. "Okay, Katie.....let's go talk Mam out of that clinic!!!" Laughing, the two scotties walked, paw in paw, to their waiting Rolls. Yes, they had to admit it......BASHES were such fun!!! And, so we have survived another terrier tale. We find ourselves, once again at the END of another BASH adventure. Take a deep breath, let it out slowly, and just be glad it's not YOUR credit card!!!!!!!!!!! �Copyright 2002-2005 All rights reserved.